N afplion was the first capital of Greece after the liberation of the country from the Turkish and as such has a plethora of historical monuments, fascinating narrow roads with Venetian style overhanging balconies and impressive castles of Palamidi, Acronafplia and the Bourtzi Castle in the middle of the harbour. Bearing in mind its location, Pension Filyra is the perfect place from which to visit and explore the wonderful sites of the Argolida and the Peloponnese whilst having a superb base to return to. Enjoy a short boat ride to this offshore Venetian castle, which affords superb views back to Nafplio and is the host of live music events. 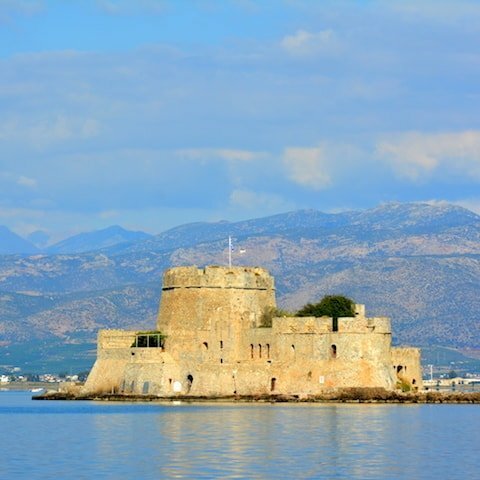 The Castle of Bourtzi is one of Nafplio’s great Venetian-style landmarks. It sits on a rock-island just off Nafplio’s small harbor and looks back across the city and out toward the Argolic Gulf. Explore the castle’s rooms and enjoy spectacular views from its ramparts. 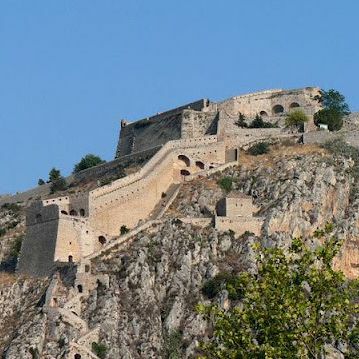 Built by the Venetians in the 1400s, the Castle of Bourtzi was originally part of Nafplio’s fortifications. Upon completion a chain stretched from the castle to the bastions of Acronafplia, on the mainland. This served to protect Nafplio from pirate attacks and invasions. Throughout its long history, the castle has been an executioner’s residence, hotel and restaurant. Today, it is one of Nafplio’s most picturesque attractions. The Castle of Bourtzi is open daily. Get there by taking a boat taxi from Nafplio’s harbor. Boats depart at regular intervals throughout the day. Have your camera ready to take pictures of the castle with the mountains of Arcadia in the background. Come to the harbor after sunset to admire the castle illuminated by a series of bright lights. Admire the well-preserved fortifications of this Venetian fortress and then enjoy spectacular views of the wild beauty of Nafplio’s coastline. Perched on a hilltop overlooking Nafplio and the Argolic Bay is the architecturally impressive Fortress of Palamidi. Stroll amid the fortress’ solid stone walls to spot well-preserved bastions and monuments. The Venetians constructed the fortress in the early18th century and it was added to by the Ottomans, after they conquered the city in 1715. The fortress takes its name from Palamedes, a Greek mythological hero of the Trojan War. There are two ways to access the fortress. One is to climb the 800-plus step staircase which leads up a steep hill to the west entrance. As you climb the staircase the views across Nafplio and its surroundings get better with each step. Keep an eye out for the original vaulted staircase, characterized by gaps in the roof that helped provided ventilation. The other option is to drive to the main entrance situated on the east side. 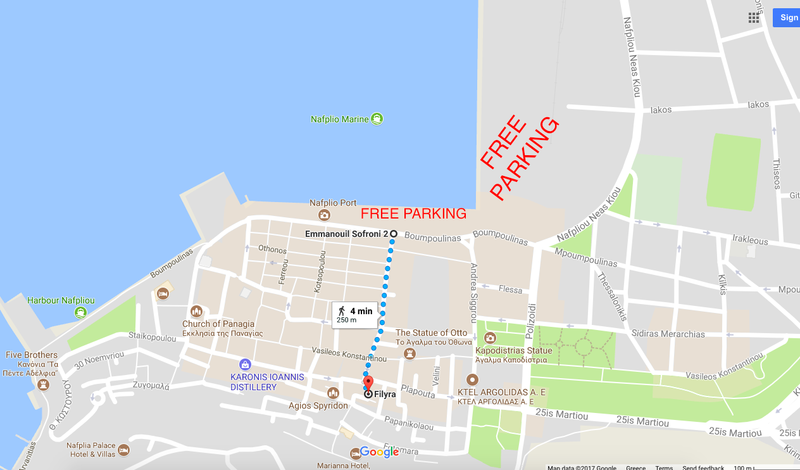 From Nafplio’s city center it’s a 10-minute walk to the fortress’ west entrance and a 15-minute drive to the east entrance. There’s a small car park outside the east entrance. From May to November a city sightseeing bus stops at the fortress. The Fortress of Palamidi is open daily and there is an admission fee. Collect the information brochure at the entrance and follow the self-guided tour. Concerts take place at the fortress in the summer months. Ask at the entrance for details. Wander the ruins of this ancient fortress to enjoy unrivaled views of Nafplio’s historic Old Town and the northern bay of the Argolic Gulf. Rising out from a headland above Nafplio’s Old Town is the ruined castle of Acronafplia. Stroll around the castle’s ramparts to spot the remnants of centuries-old monuments. 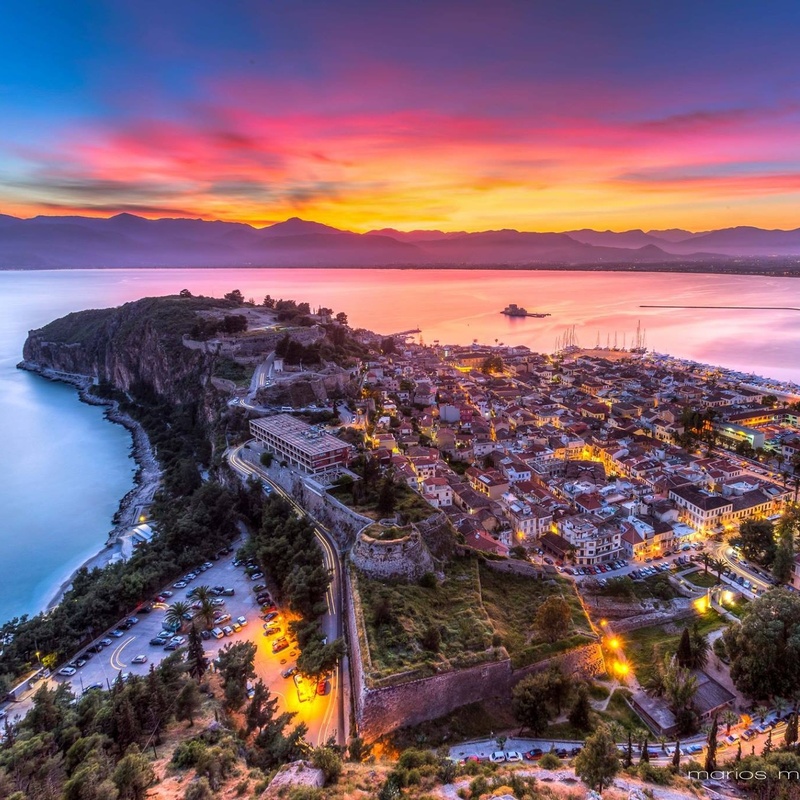 Enjoy views back across Nafplio’s historic center and marvel at the sunsets over the Argolic Gulf. Acronafplia is the oldest of three castles located in Nafplio, built over hundreds of years by the Romans, Venetians, Franks and Turks. Walk to the western side of the castle, where the walls provide evidence that Nafplio has been a fortified city since around 400 B.C. Check out the hotel, which stands on the site of a former military barracks, hospital and prison. Go to the far westerly tip of the headland to see the bastion known as Pende Adelfia (The Five Brothers). The name relates to the five well-preserved canons that point out into the surrounded bay. 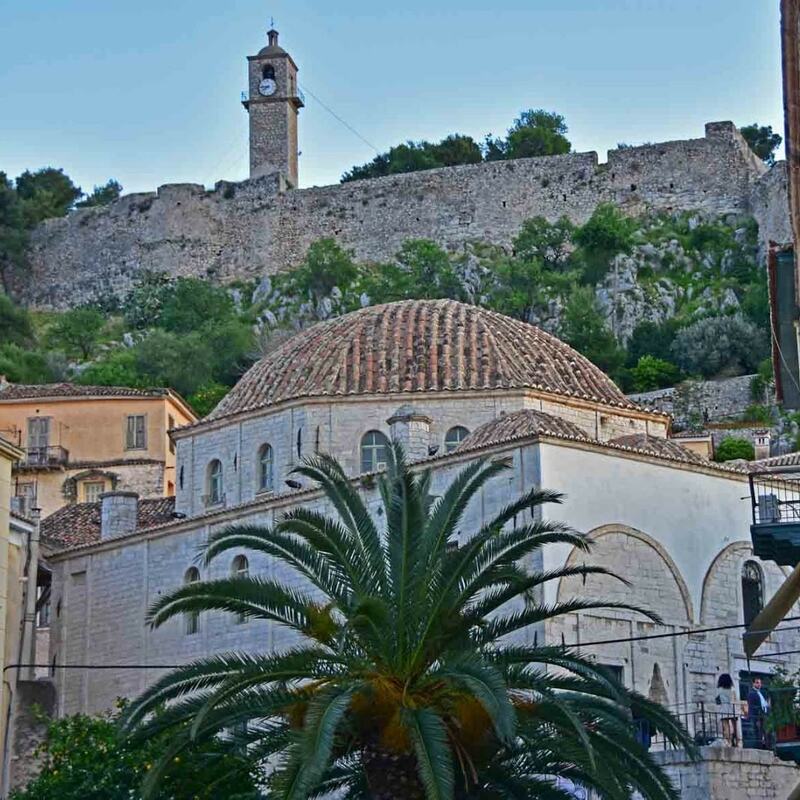 Situated on the southwestern corner of Nafplio, Acronafplia is easily reachable from all parts of the city. It’s about a 10-minute walk from Syntagma Square and Arvanitia Beach. An alternative way to see Acronafplia is to walk along the Arvanitia Promenade. This coastal pathway runs around the base of the castle from Arvanitia Beach to the Port of Nafplio. The castle is open daily and entry is free. Relax on this small beach, take an invigorating swim in the warm water of the Argolic Gulf and enjoy picturesque coastal walks. Arvanitia Beach sits in a small cove and is a beach made up of white pebbles and rocks. Its close proximity to the center of Nafplio makes it popular with tourists and locals alike. You can rent beach lounge chairs and parasols and there are public changing facilities. Bring a picnic or have lunch at the café situated on the rocks above the east side of the beach. Sit back and enjoy the views across the Argolic Gulf and toward the mountains of Arcadia. Alternatively, cool off with an energizing swim in the warm and perfectly clear water. Lifeguards patrol the beach, thus making it a safe swimming spot for children. Leading from the beach are two scenic walks. One is the Arvanitia Promenade, a seafront walk that starts at the beach before winding around the base of Acronafplia castle to the Port of Nafplio. The walk only takes about 20 minutes but there are plenty of things to see on the way. Look up at the canons that point out toward the bay from the castle’s bastions. At various points, steps lead down to the sea and to uninterrupted views. Watch as the sun drifts down behind the mountains on the opposite side of the bay. A longer walk will take you to Karathona Beach. Follow the coastal path for about 2 miles (3 kilometers) to discover a long, sandy beach lined with palm trees. If you are feeling active then rent watersports equipment such as kayaks and snorkeling gear. Enjoy fresh fish and seafood at one of the traditional taverns that overlook the beach. Arvanitia Beach is just a 10-minute walk from Syntagma Square, in the center of Nafplio. Parking is available at Arvanitia Square, situated above the entrance to the beach. 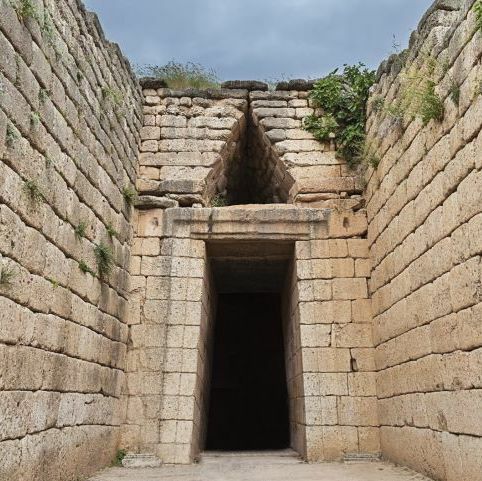 You can visit the Treasure of Atreus, which is the most impressive of the preserved Mycenaean tholos tombs, situated at Mycenae, the Underground Cistern that leads to the underwater cistern, 18 meters below the surface, through a steep decenting path paved with stone, the famous Cyclopean Walls and the Lion's Gate. In Mycenae is located,also, the Archaeological Museum where a variety of objects unearthed in the vicinity are exhibited in its three halls. It provides context to the excavations and it is easily visited after a tour of the archaeological site. The theatre of Epidaurus represents the finest and best-preserved example of a classical Greek theatre. Even by today's standards, this monument stands out as a unique artistic achievement through its admirable integration into the landscape and above all the perfection of its proportions and incomparable acoustics. It was built in 330-20 BC and enlarged in the mid-2nd century AD. The overall 55 rows of seats rest on a natural slope and face the stage area set against a backdrop of lush landscape. The theatre is marvelled for its exceptional acoustics. Any sound on the open-air stage, whether a stentorian voice or a whisper, a deep breath or the sound of a match struck is perfectly audible to all spectators, even in the topmost row of seats, that is, nearly 60 m away. The answer to what makes the sound transmit so well comes from recent scientific studies: The arrangement of the stepped seating rows acts as an acoustic filter that deadens low-frequency background sounds, such as the murmurs of the audience, while amplifying the high-frequency sounds from the stage. 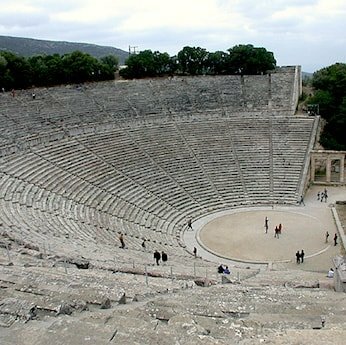 Once again in use today, the ancient monument floods with theatre devotees during the annual summer Festival of Epidaurus. To avoid the sold-out disappointment, book early! Here you can find information about the events of the Epidaurus festival. It is a half-hour drive from Nafplio and approximately two hours from Athens. Visit the War museum where you can a thematic presentation of the Greek state fighting and struggles. See, also, the stone-built Venetian Archaelogical Museum that is historically divided into several themes, from the remotest pre-historical exhibit to the period of antiquity, demonstrating the walk and the mark of every civilization setting foot in Argolida Prefecture. 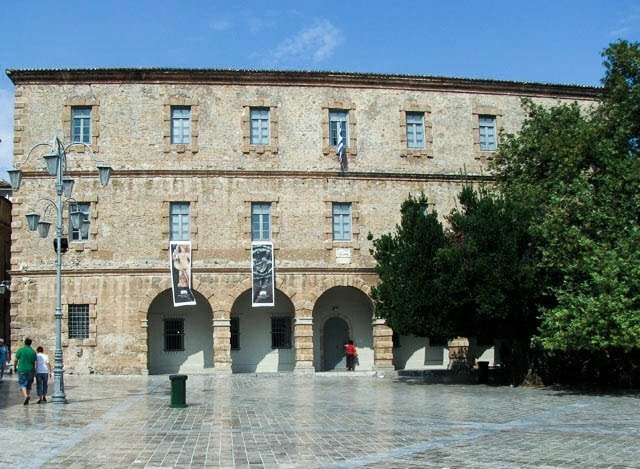 A Chaplet Museum is also located in Nafplio, where preserves the chaplet and familiarize the public with its history. The building of the first Parliament in Greece, the Armansperg Residence, the Customs House, the Courthouse and the Trianon are some of many known & important buildings in Nafplio.It is,also, worth to visit the Land Gate and see the statue of Staikos Staikopoulos.Also,enjoy your promenade in Psaromachalas one of the oldest and most picturesque neighbourhoods in the city that it covers the north-western foot of the Acronauplia, above Staikopoulos Street. 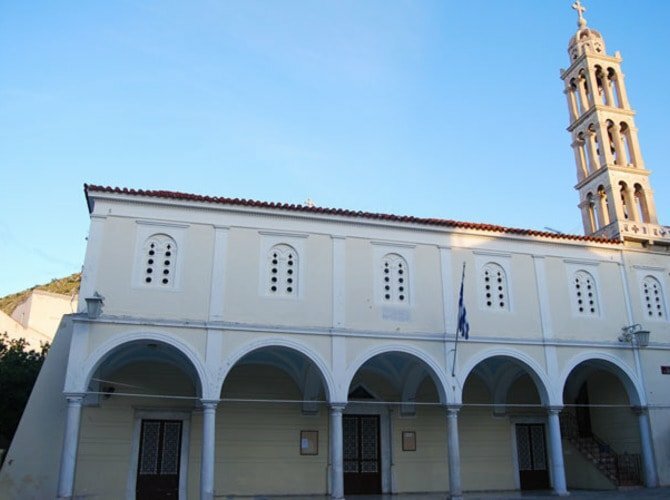 Meet the Church of Aghios Spyridon where Ioannis Kapodistrias was murdered and the Metropolitan Church of Aghios Georgios,one of the oldest churches in the city. Climbing the steps from Potamianou Street, from Aghios Spiridon Square, reach the Catholic church, which has become known as 'Frankoklisia'. There are plenty of beaches around Nafplio.Some of them are Karathona located in the city, Tolo which is about 10 minutes away from Nafplio, and Plaka. Moreover, you can visit Kondyli (St. Nikolaos), about 30 minutes far by car from Nafplio, or Vivari. Also, here you can find information about the bus routes and the ticket prices. In Nafplion and closeby it is possible to take part in a huge variety of activities, in particular watersports such as sailing, windsurfing, scuba diving, waterskiing, boat rental and kite surfing and in addition to the wonderful archaeological interest of the area such as Ancient Tiryns, the Ancient Theatre of Epidavros and Mycenae one is also able to take a day cruise from the harbour to the islands of Hydra, Spetses & Poros. For the more adventurous try your hand at bungey jumping over the Korinth Canal, go-carting, Loutraki Waterfun Park amd for nature lovers there are organised walking trips, wine tasting, ouzo tasting, home Greek cookery lessons and many other things to occupy your time in Greece Combine the history of Nafplion, the location, the wonderful architecture, great nightlife and magical atmposphere and it is a destination loved and re-visited by all. Here you can find information about the alternative forms of tourism in the Peloponnese.